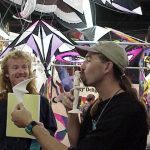 Issue 8: What’s New for 1999? 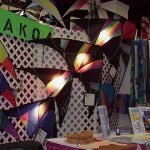 The Kite Trade Association International held their annual convention and trade show in Clearwater, FL from January 20-23. 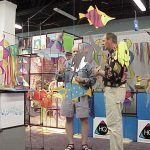 This gathering brings together manufacturers, retailers and distributors to showcase new products and stock the distribution channels for the coming season. It is a great chance to get a snapshot of the sport and spot trends. 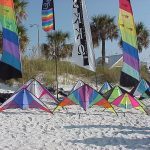 The trend that was impossible to ignore is the growth of yo-yos and other toys as the lifeline for kite retailers. 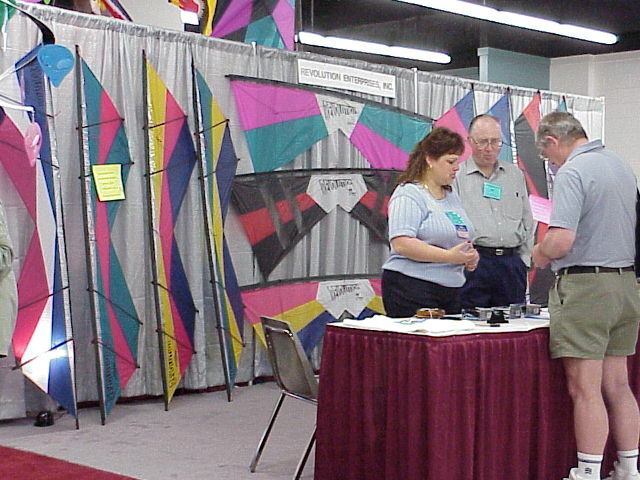 Out of the 64 exhibitors, 11 of them were yo-yo companies, and it is a safe bet that those eleven wrote more orders than the kite companies, combined. 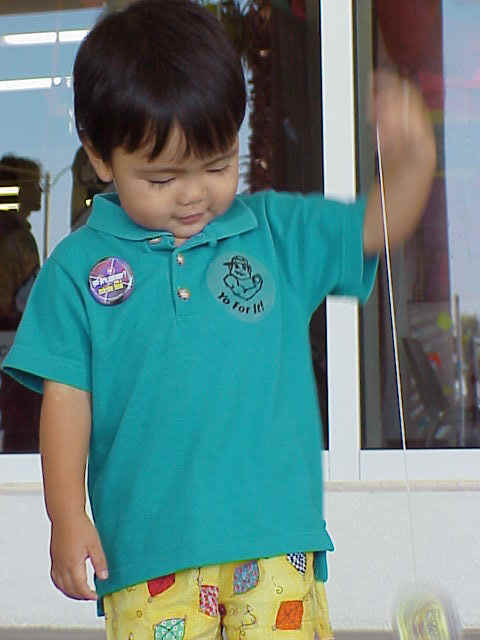 How big is the yo-yo craze? 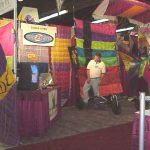 One kitestore owner rented several kiosks in area shopping malls last December, and sold One Million dollars worth of yo-yos in four weeks. 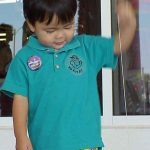 Hoy Quan, the owner of BFK, has turned his kite business over to an assistant in order to keep up with his yo-yo business. 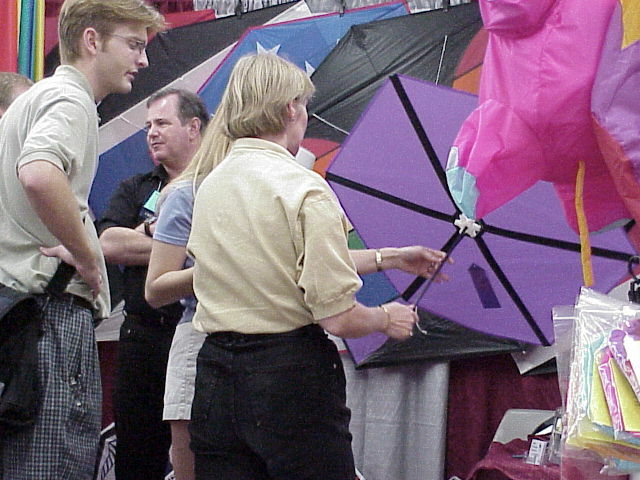 Saturday morning at the show, one of the yo-yo pros was doing a demonstration. 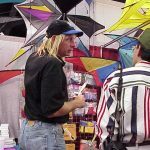 With his multiple piercings, whole-body tattoos, and bizarre coiffure, he displayed a fine example of the breed. 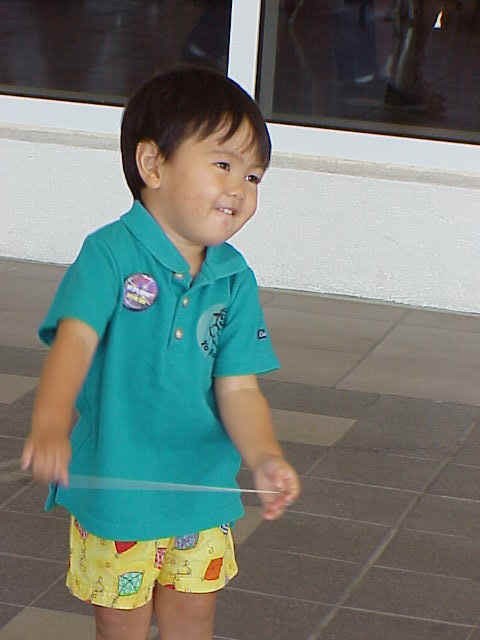 During an especially wild maneuver, his yo-yo string broke. 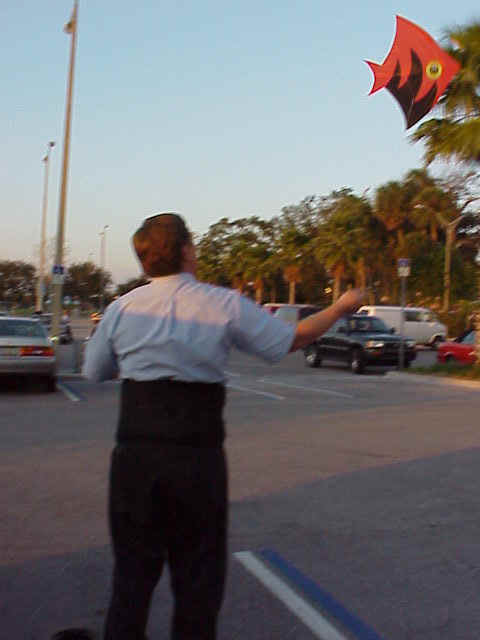 The yo-yo flew like a Mark McGuire homer, and clocked a kite manufacturer in the head. 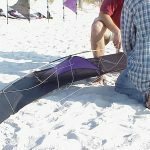 Yet another example of the “impact” of toys on kiting? 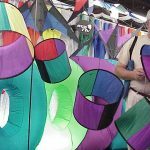 Another trend is the continuing downward spiral in kite prices. 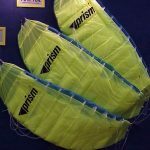 Many manufacturers are now offering full-size sportkites in the $100-150 range. 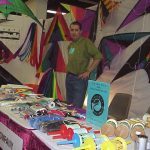 Eight years ago, a fiberglass and nylon Spinoff with a lineset cost me $225! 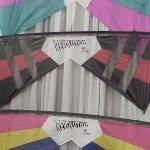 Certainly, there are still high-end kites that command a higher commitment, but the largest growth seems to be in the lower-price arena. 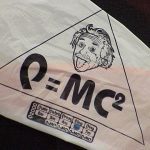 Here, we will give a brief summary of items that we found new and noteworthy. 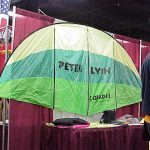 Brian Smith and the gang were showing the whole range of Quadrifoil and Peter Lynn products. 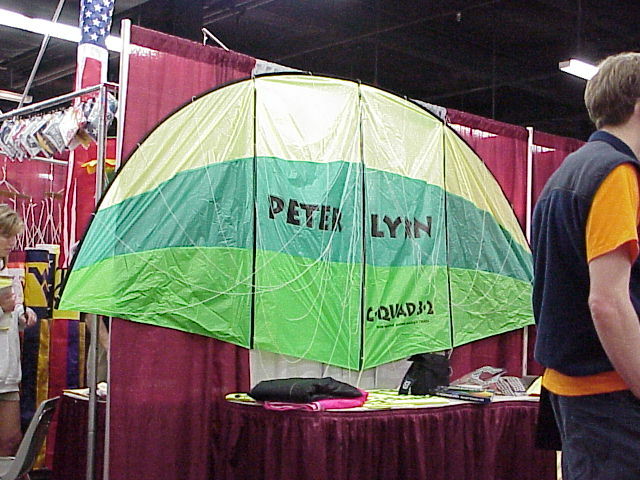 The most unique item they showed was the new Peter Lynn single-skin traction kite, which should be an excellent engine for kiteboarding and kitesailing. 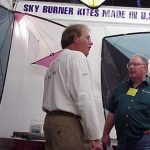 Avia unveiled a new generation of wrapped carbon rods at the show. The new “Excel” rods use a new construction technique to achieve a new level of toughness at a low weight. 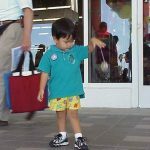 The old problem of splitting the rod at the ferruled end should be a thing of the past. We took a sample of this rod, and attempted to split it, by inserting a long ferrule into one end and bending the rod over a knee. We couldn’t break the thing! Also, Avia showed the new “Plus3” rods. Designed for extreme strength at a low cost, these rods are pultruded carbon with a fiberglass insert. 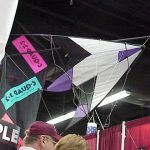 Makers of the fine “es/55” Spectra line, BBS unveiled their new sport grade line, “es/33” at the show. 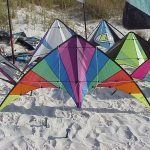 This line offers good performance at a very low cost, and should become standard issue with kites under $100. 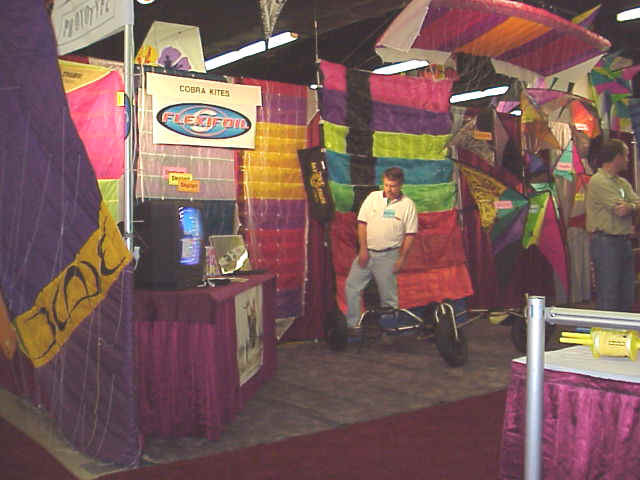 The US branch of Flexifoil had a great booth that got lots of traffic. 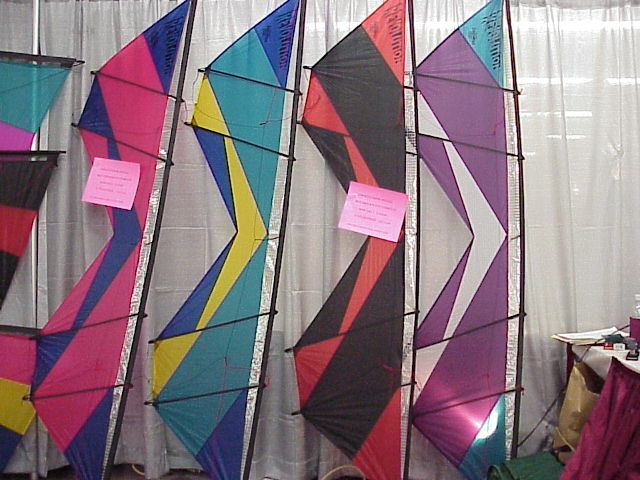 They showed the sportkite line, as well as the line of Skytiger traction kites. 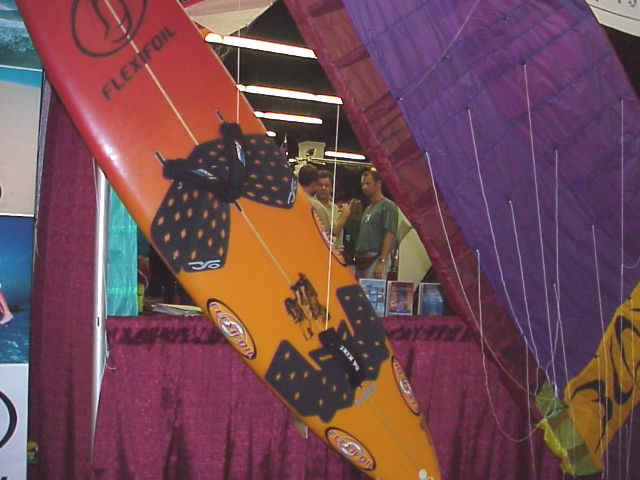 New this year is a kite-surfing board, and a new high-performance traction engine, called the “Blade”. 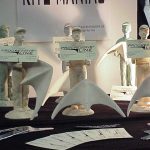 Both attracted a lot of attention from retailers. 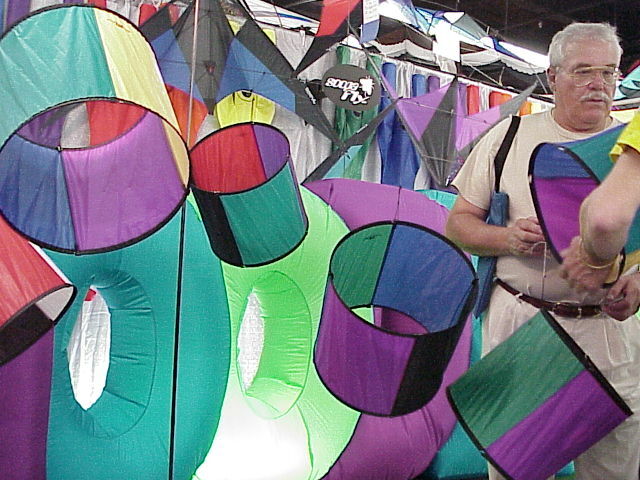 Dodd Gross had the most ornate beach display, as well as a booth jam-packed with nice kites. 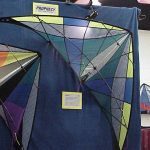 Since his split with HQ-Invento, Dodd has assembled a line of sportkites from various European manufacturers, with Eolo Sport of Spain providing the featured models. The “Rainbow Jam”, retailing for $99, should be a winner in the stores. 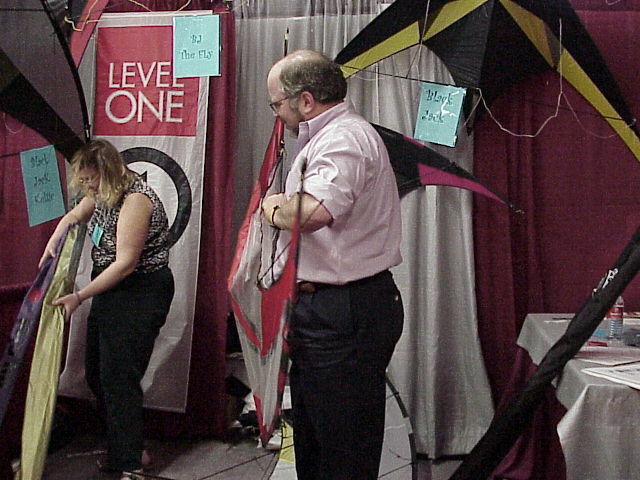 The Freestyle, Precision, and Indoor/Outdoor also were getting lots of attention from dealers. Last year, Flying Wings stole the show with the Beetle. 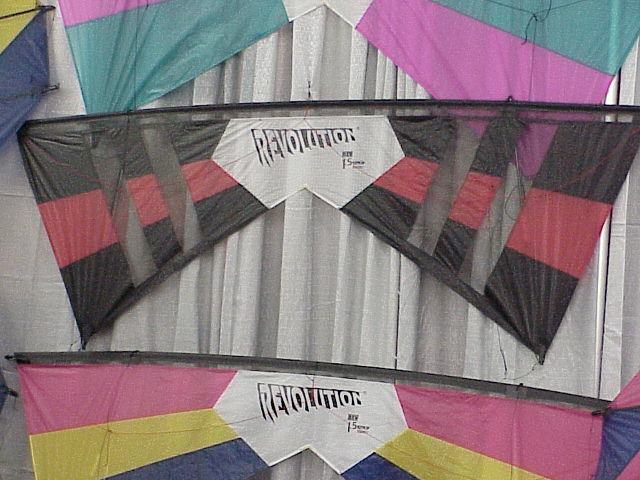 They did it again this year, unveiling two exciting new sportkites, the Icon and the Utopia. 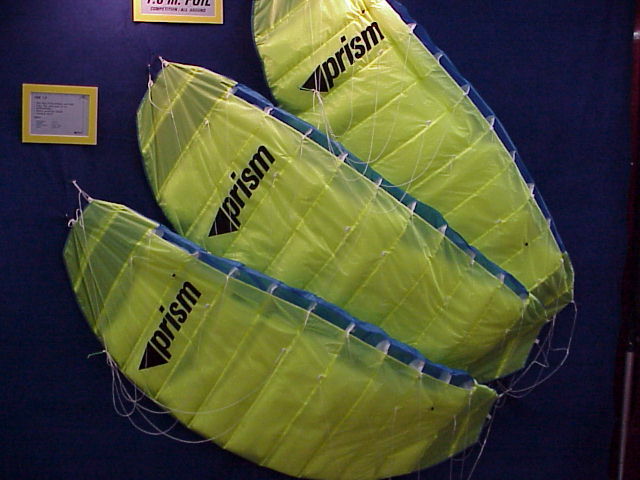 Both kites feature very innovative designs at a low cost. 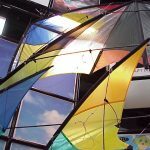 The Utopia,designed by Martin Schob of Tricktail fame, has separate sails for the wings and center section, leading to a very dramatic appearance. 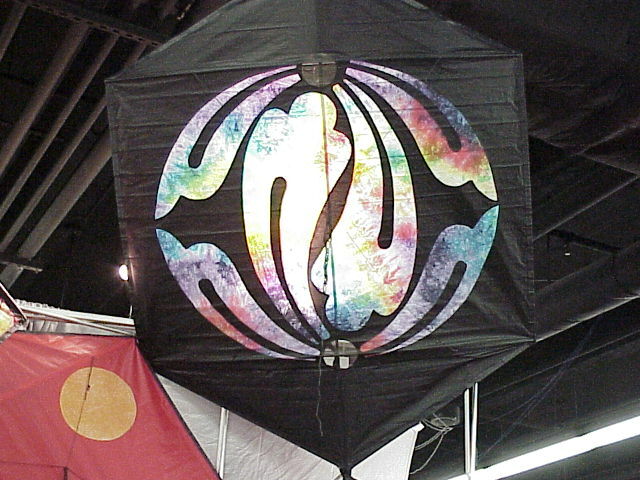 The kite has multiple adjustment points, to alter the wind range and flying style. 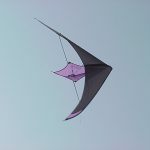 We saw the kite performing well in a huge range of wind, probably from 1 to 20 mph! 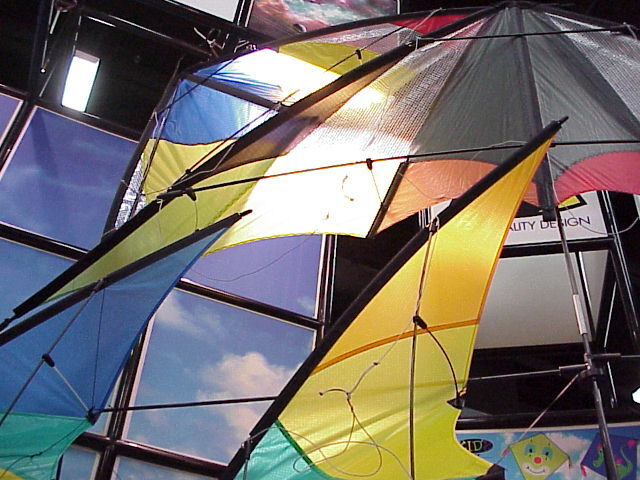 This kite will retail for about $150. I have already made room in my bag for one of these. 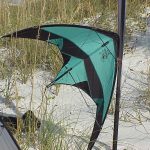 The Icon is a $100 kite that features a curved spine and radical traits. It looks to be an exceptional value. 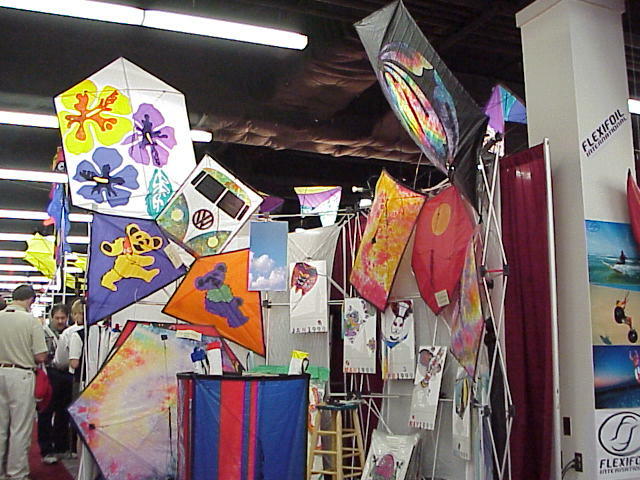 David and Susan featured their normal eclectic collection of unique kites and accessories. 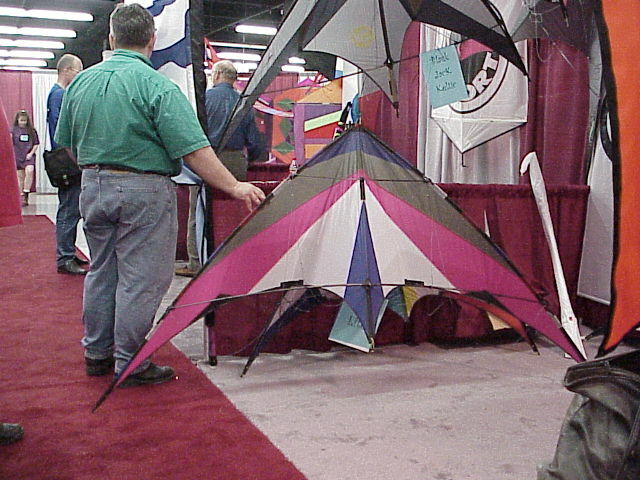 Attracting attention were the Rondeau “Poppers”, an interesting line climber. 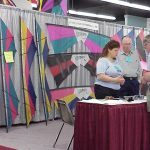 Also new and noteworthy are the “Gomberg Guides”. 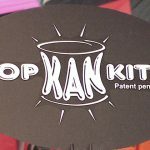 These laminated field cards are made to slip into a back pocket or kitebag, and offer great “how-to” information. 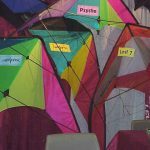 There are six guides in the series, covering different topics, from basic skills through advanced tricks. 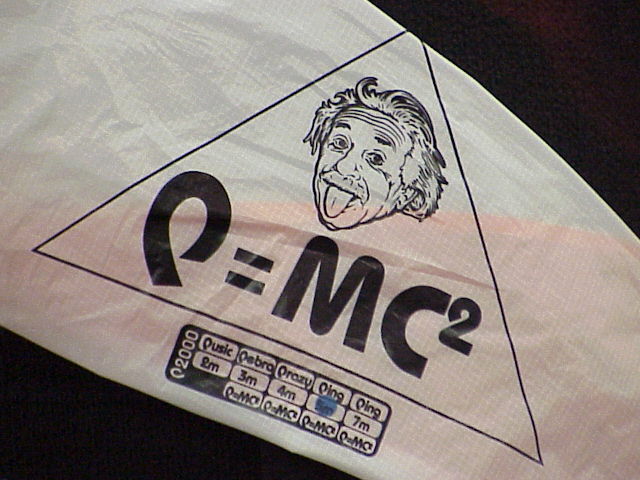 These should get wide distribution, as they could help ease the learning curve for the new flier. 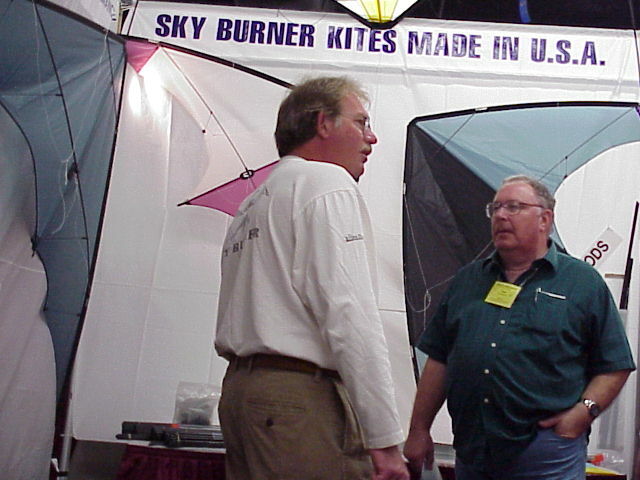 They were awarded a “Best New Product” award from the Association. 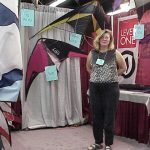 Kathy Goodwind and crew had a great show, winning “Best Booth” award, and a “Best New Product” award for the innovative “Pop Kan Kite”, designed by Kathy’s son, Todd. 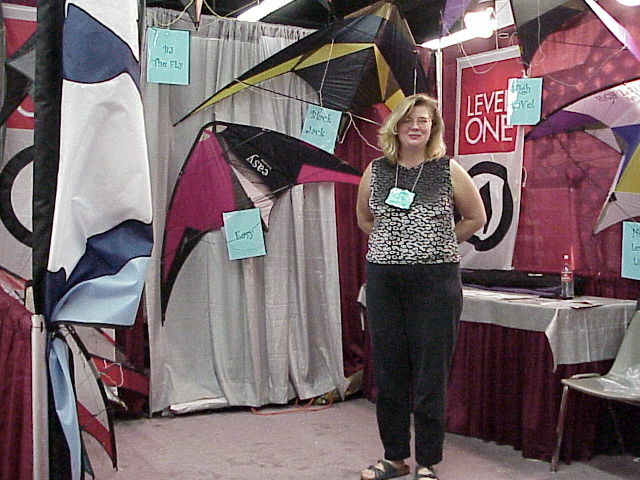 If this kite can achieve distribution to toy and department stores, Kathy will be kiting’s first zillionaire. 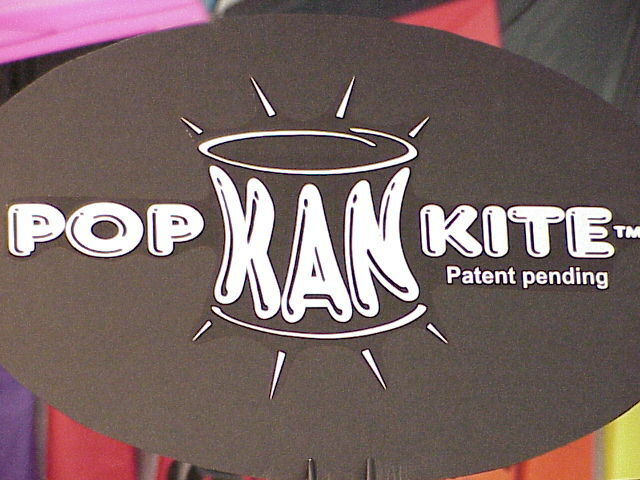 The Pop Kan Kite collapses into a flat circle, with the flying line spool fitting in the center. It is easy to imagine every soccer mom’s mini-van having one or more of these stashed under the front seat. 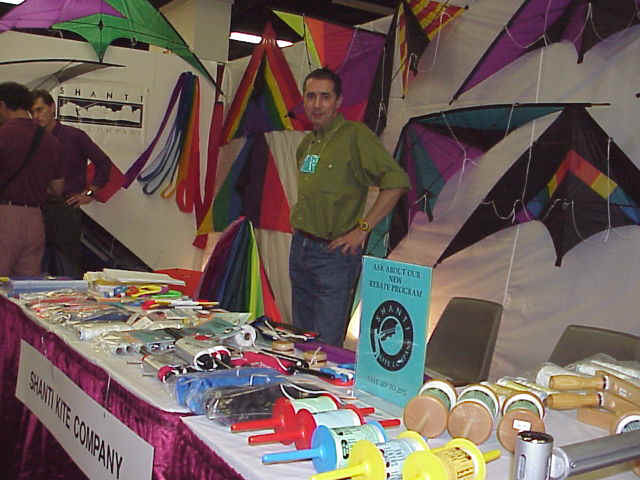 Ty Billings had a great assortment of his tie-dyed Japanese-style kites. 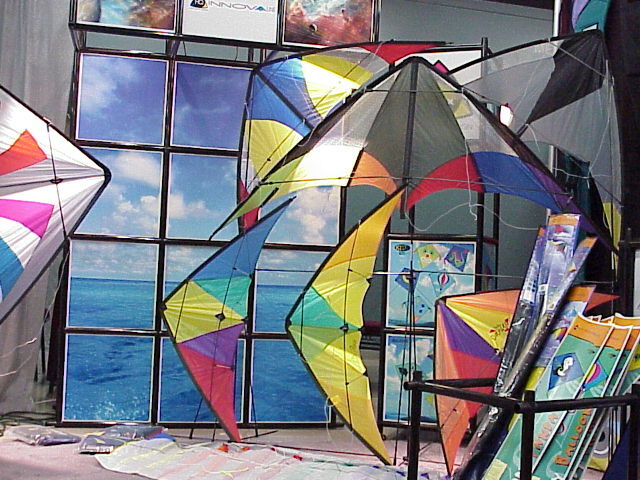 Nothing super-new or unusual, just a nice group of kites fit to hang on a wall as decoration, or fly for fun. 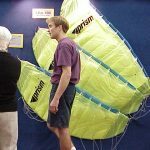 The German company showed a full line of sportkites, designed under the guidance of Christoph Fokken, and a full line of “Windspiration” wind toys. 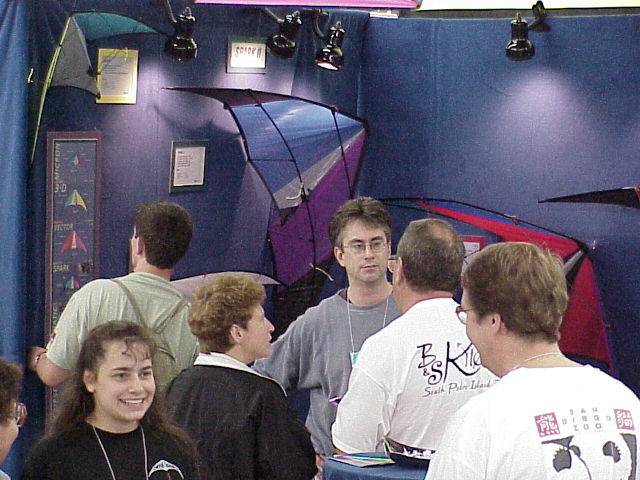 The Jam Millennium attracted a lot of dealer attention. Its design takes many cues from the earlier Jam Session, but has an updated graphic design. We didn’t get a chance to test it, but hope to have a full test in an upcoming issue. 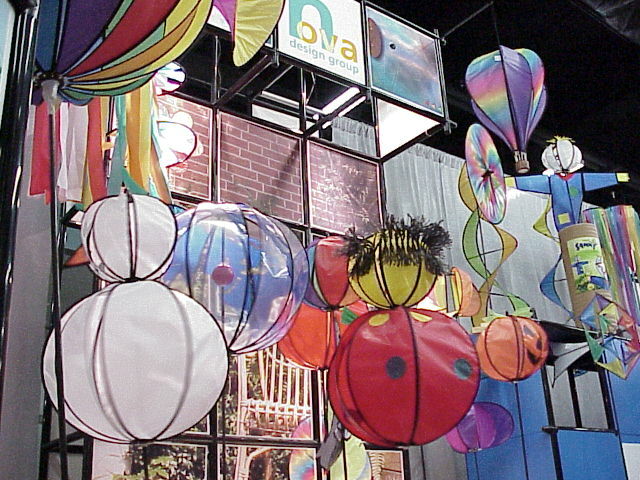 Nova Design Group is the US distribution arm of HQ/Invento. 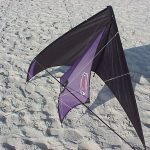 The Black Jack, the Easy, and the High Level form the basis of this line of quality sportkites. 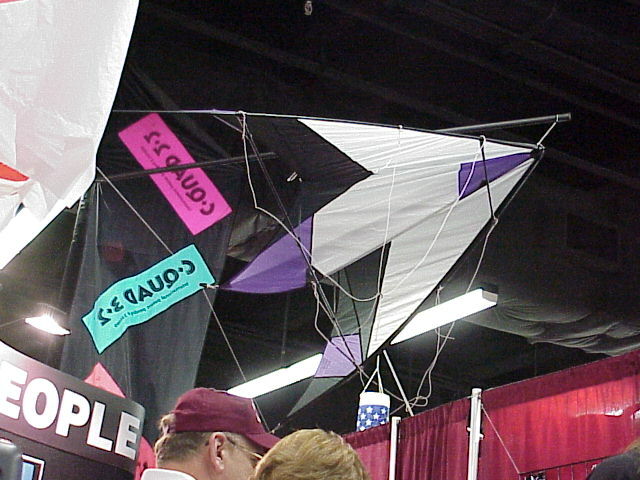 New for the show was the “V-Max”, an 8-foot kite with great crossover qualities. 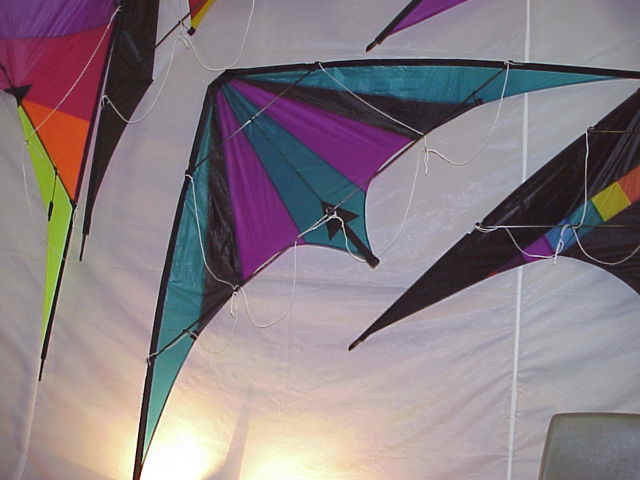 Besides doing easy tricks, this kite has outstanding possibilities for team and pairs flying. 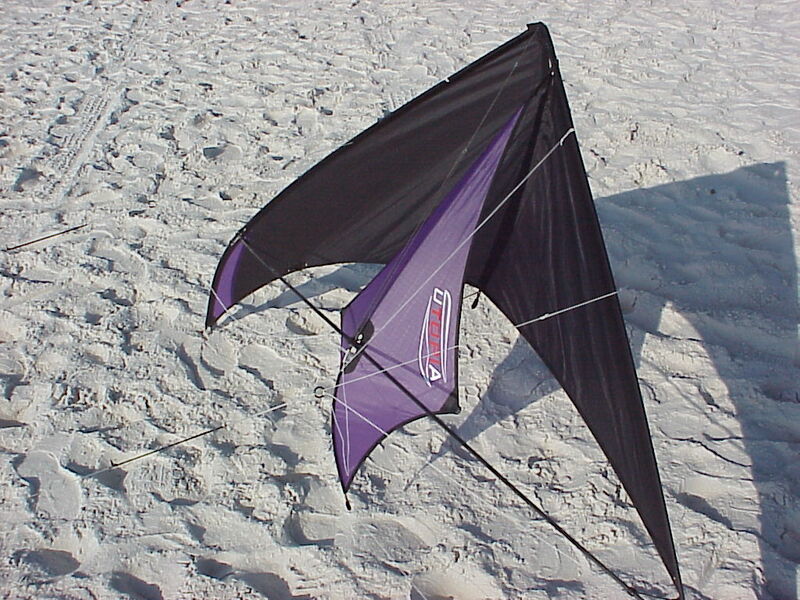 This kite is a great all-arounder… straight from a rising fade to a team compulsory. 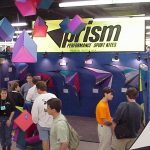 Prism continued their tradition of having one of the most highly-trafficked booths. 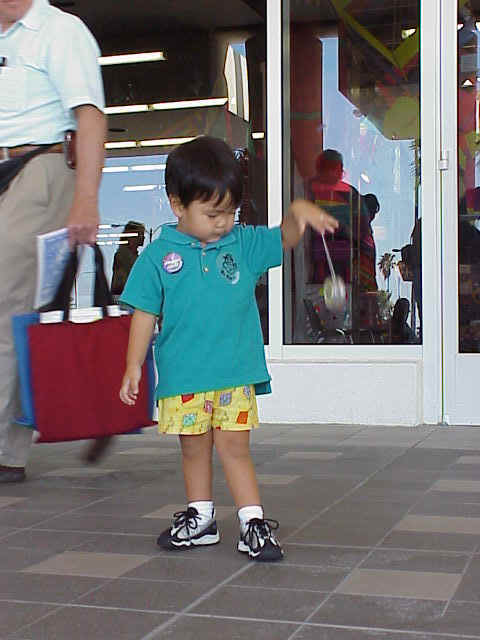 Having a never-empty bowl of Prism Candy helped, but this marketing powerhouse did almost everything right. 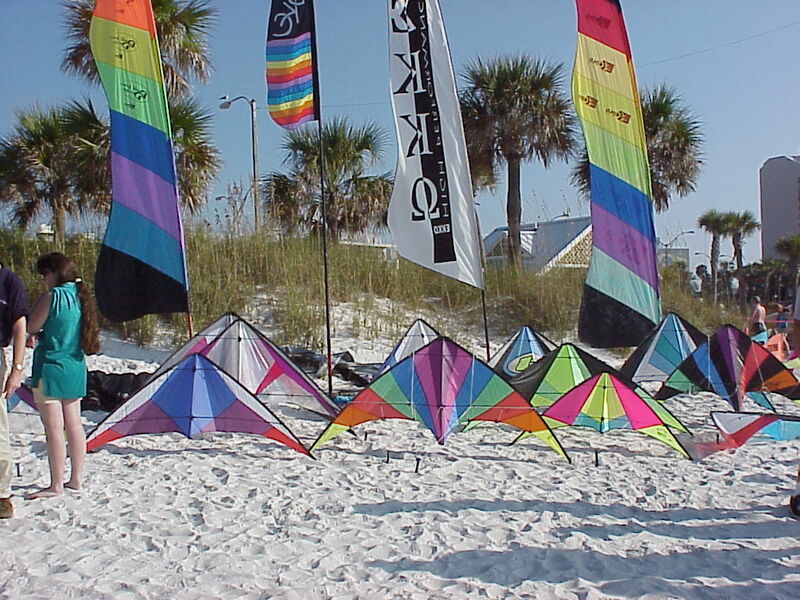 In our opinion, Mark Reed and his crew continue to set the pace for producing and marketing high-end sportkites. 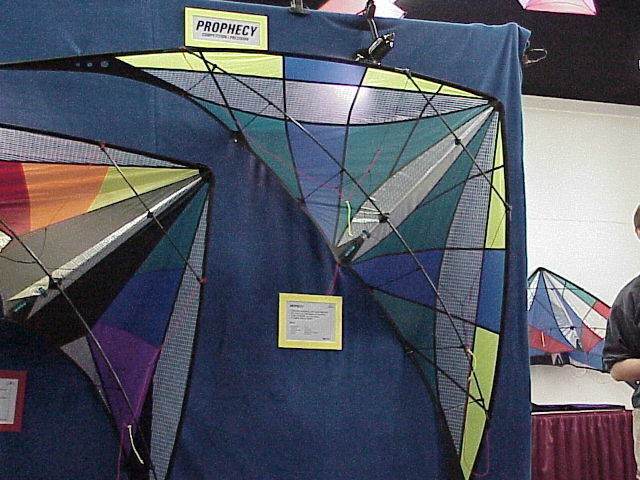 Their new Prophecy precision/team kite drew mega-attention, but the star of the booth was the new line of Foils. 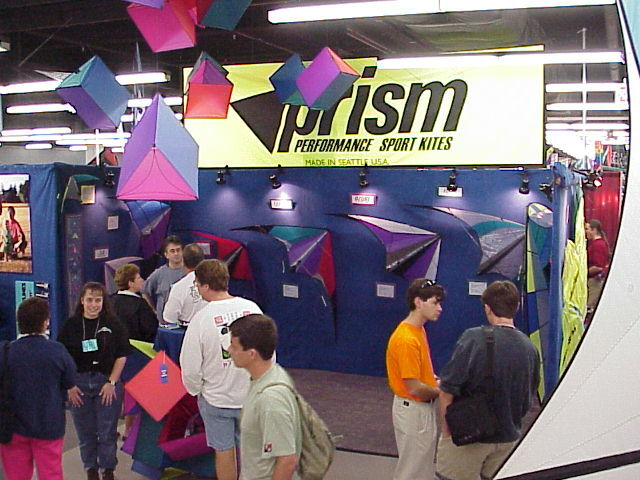 After the very public unveiling process for the Prophecy and Elixir (trick kite), they sucker-punched everyone with the sudden appearance of the Prism Foil. 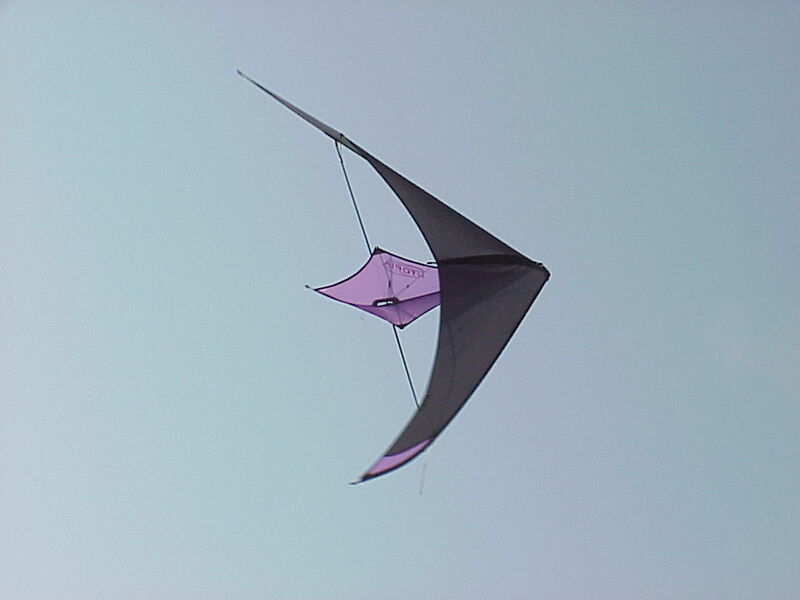 The Prism foil is a sparless kite, designed for easy stacking. 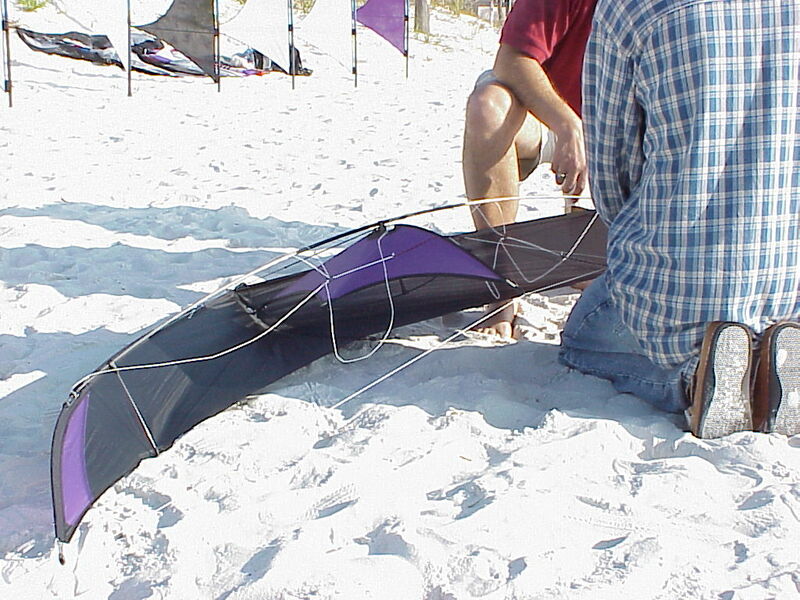 We watched it being flown on the beach on Saturday, in howling winds. 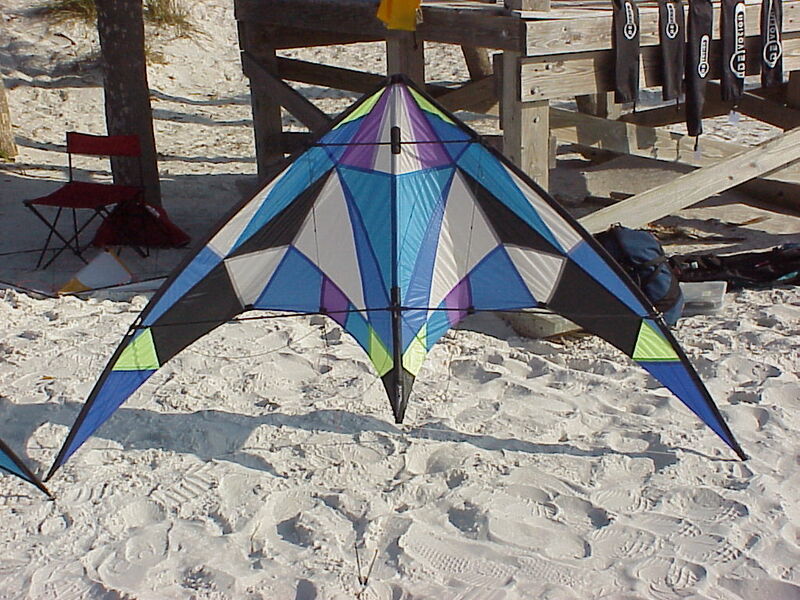 This kite is not meant to be a traction kite, but looked like a lot of fun in big wind. 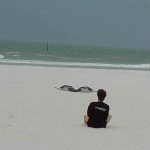 We hope to have a test in the near future. The Elixir was on display, but not ready for Prime Time. 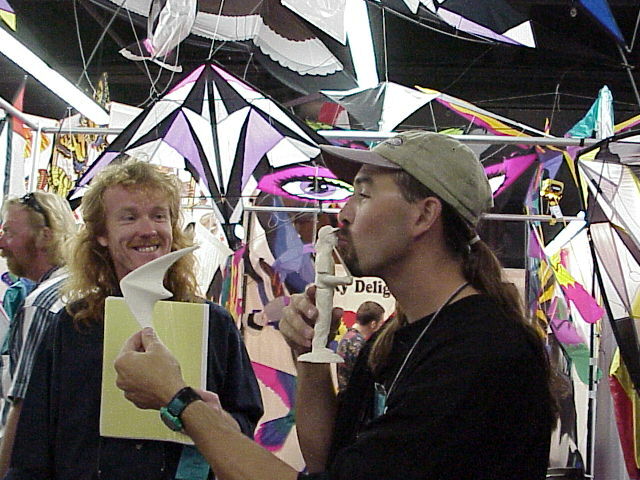 The display model did not have a bridle, there was a lot of guesswork as to why. 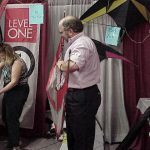 One side said “they can’t get it to fly”, the others said “Mark must have some wild new bridle design that he doesn’t want stolen.” Personally, I think that the latter is closer to the truth. 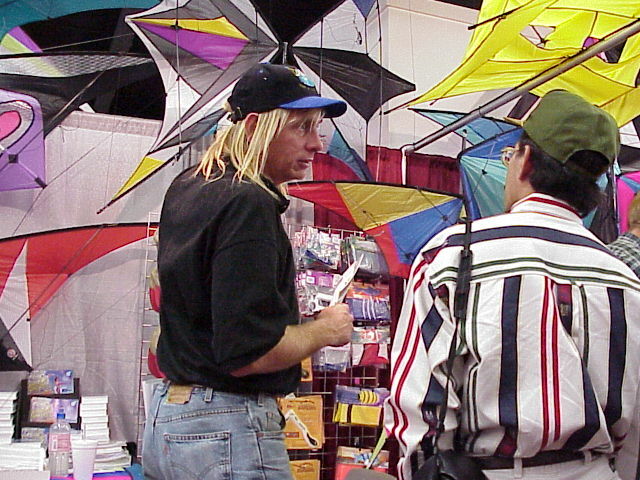 Sunny Schollenbruch showed his innovative line of sportkites and accessories to great attention. 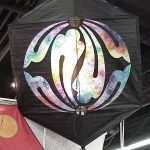 The Voodoo has been attracting a lot of attention in the US for the last year; this year it was joined by the Gecko, a 5-ft trick kite. We tried a Gecko at the show, and brought one home. 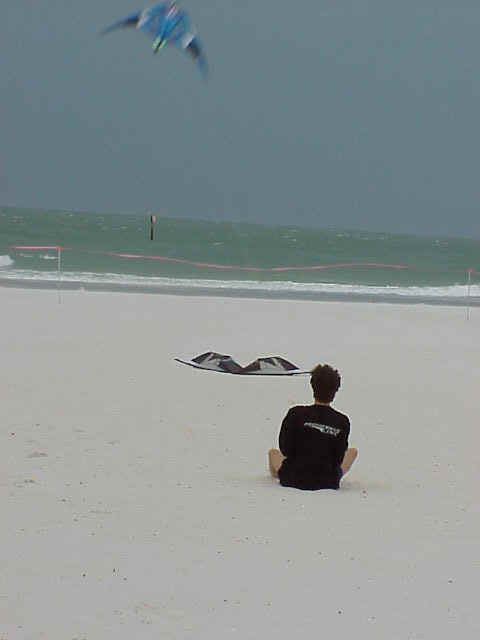 In winds over 5 mph, the Gecko is a whole lot of fun. 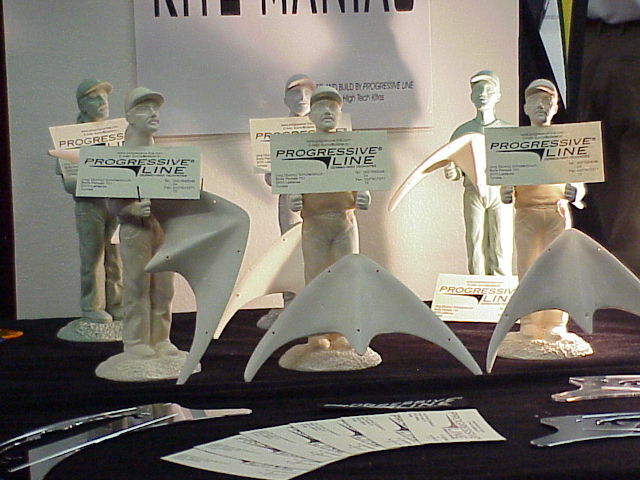 Also, Sunny had a line of winders, statues and other goodies. 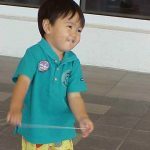 Besides making good kites, Sunny has a wonderful disposition, always smiling and having a good time. 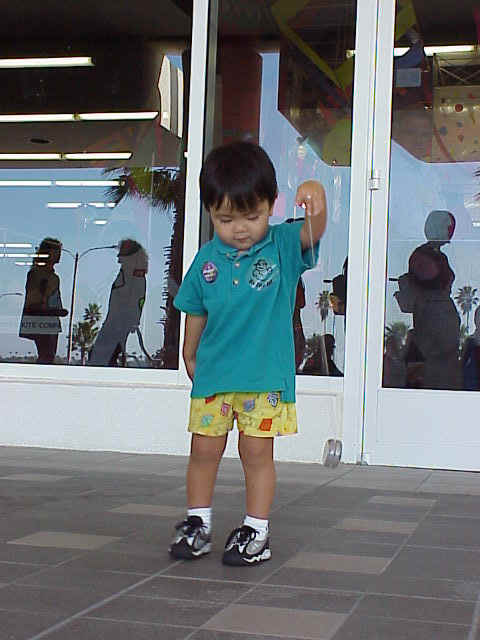 It is easy to see where his name came from. 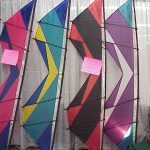 Rev showed some new color patterns for the Speed Series of quadline kites. 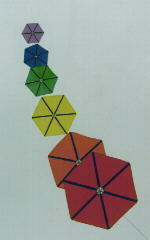 Additionally, they showed the 1.5 in new colors and vent patterns. 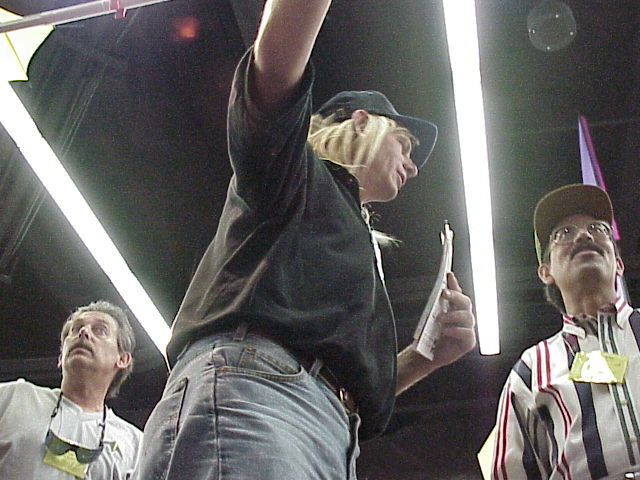 Rev has also joined the yo-yo craze, they showed a new ultra-tech yo-yo. If you can’t beat ’em, join ’em! 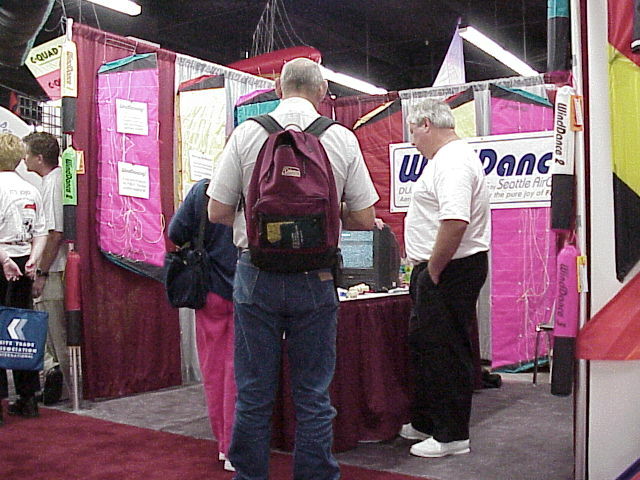 SAG makes the “WindDance” dual-line parafoils. 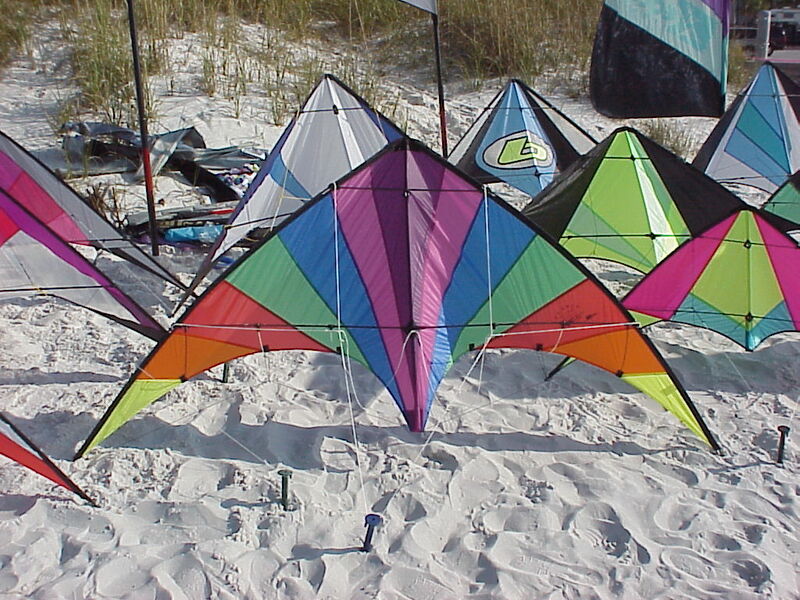 These kites are targetted at the beginner and the recreational flier, and are a lot of fun. 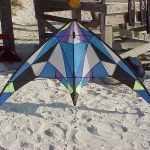 With no setup hassles, and very easy flight characteristics, these kites deserve a broad audience. 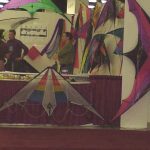 This year marks Shanti’s 25th anniversary in the kite business. To mark this occasion, they are offering retailers a rebate program to reward their business. 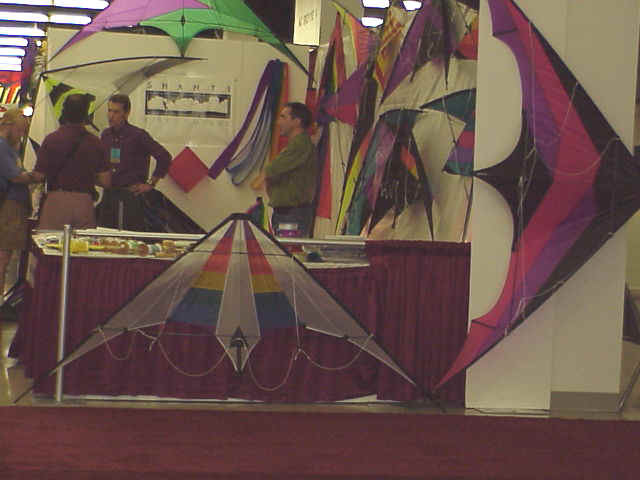 In addition to their previous models, they showed 2 new kites- the B2, a high-end kite designed by Russ Faulk of the Chicago Fire, and the Y2K, an entry-level kite. 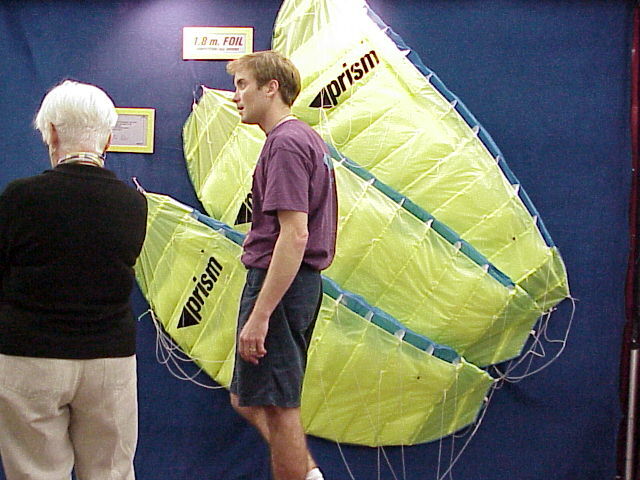 Jon Trennepohl showcased his existing line of kites, as well as the Progressive Line kites. 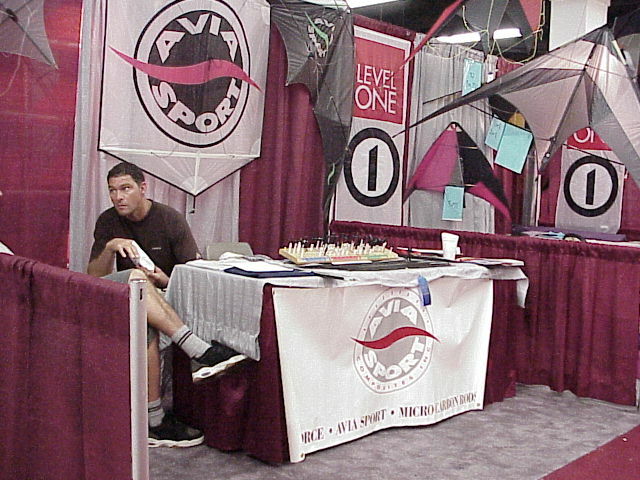 The biggest push seemed to be toward SkyShark rods. 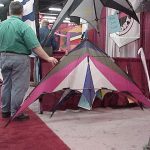 Jon is the new distributor for Skyshark. 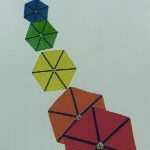 The “PT” series of wrapped tapered rods are attracting attention from kite makers and independent builders. 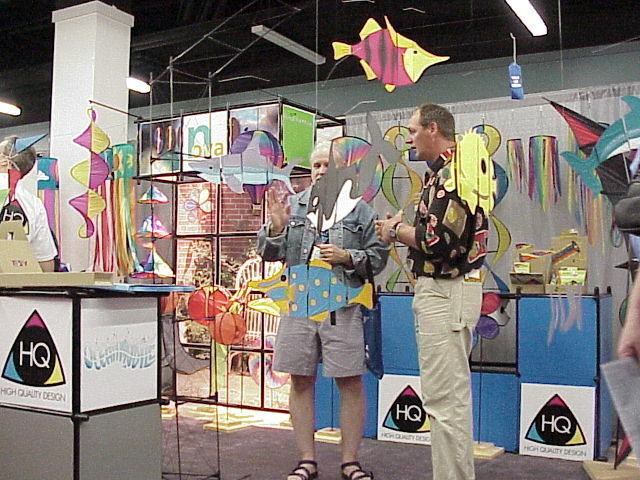 Joel Scholz showed his great line of kites. 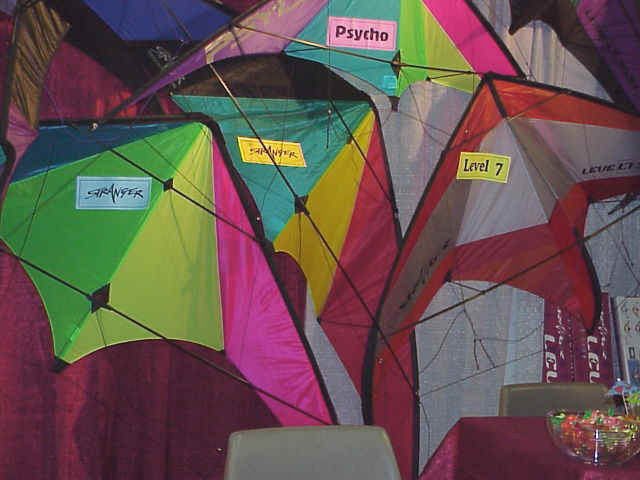 These kites blur the line between “kite” and “art”, and have attracted legions of fans. Joel has moved to some very high-tech construction methods, including a laser cutter for his sails. 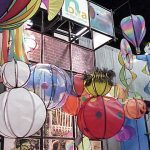 Randy Tom has joined Spectra’s design team. This should lead to some attractive designs in the near future. 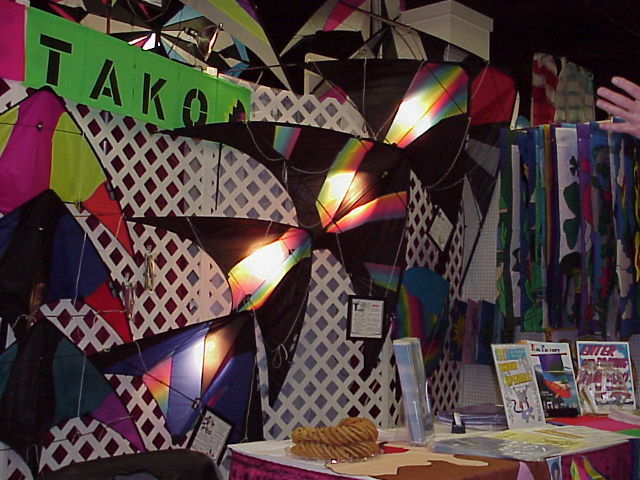 At the show, they unveiled the “Aftershock” series of sportkites. 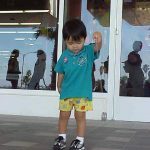 This series is approx. 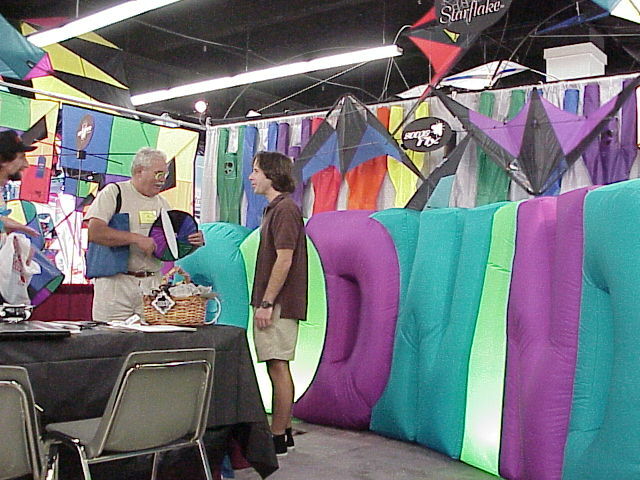 6′ wide, and priced around $75. 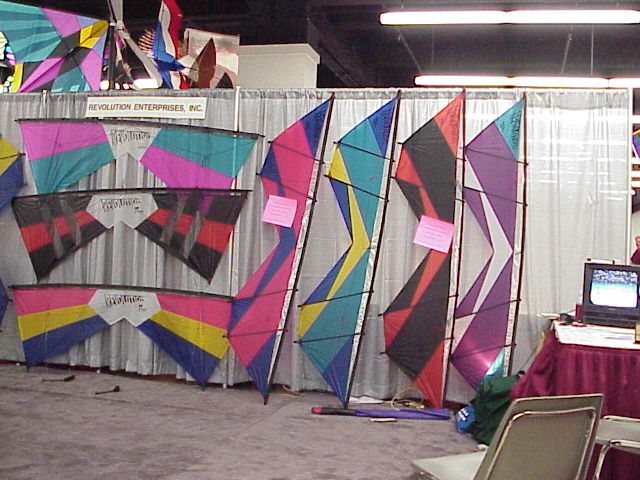 Tori showed a full line of sportkites, with the “Jazz” being noteworthy. 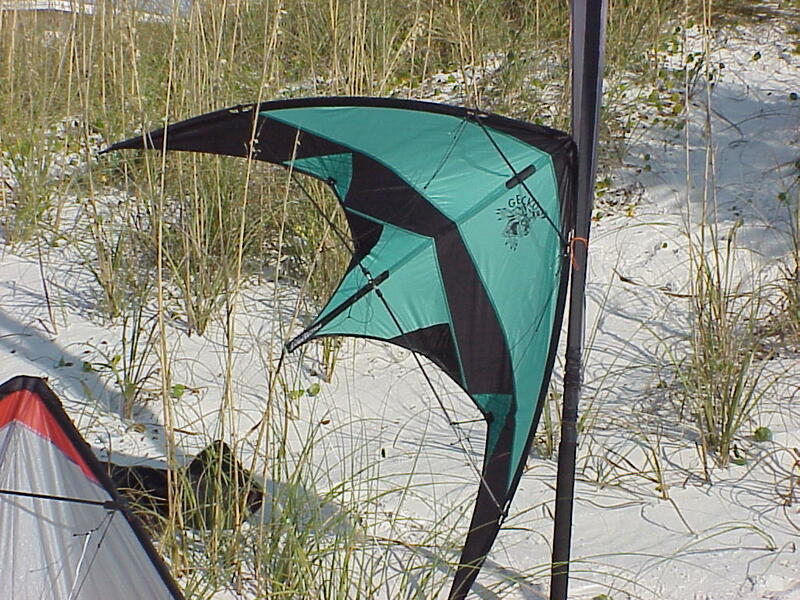 The Jazz is a 6′ kite, priced around $75, with a very attractive look. 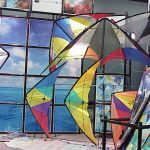 The center panel is constructed from rainbow cloth, creating a striking appearance as the sun shines through it in the sky. 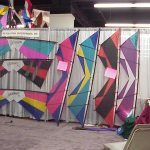 This will be another great year for kite buyers, based on what we saw at the show. 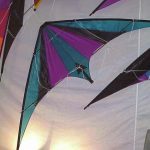 We can only hope that it is a better year for kite manufacturers than the last several have been. 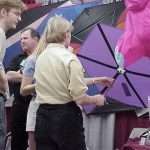 Almost every meeting and bull session dealt with the vexing topic of how to reverse the current trends of flattening sales, and attract new souls to the sport. 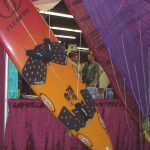 In my eight years of heavy involvement in kiting, and a lifetime in business, I have never seen such solidarity among competitive companies. 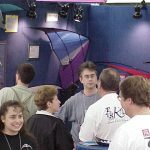 To me, that was the most remarkable thing about this year’s show. Everyone realizes that we must breed a larger pie, rather than argue over how to cut a small pie. Together, we can accomplish great things. 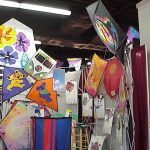 This entry was posted in Industry News, Issue 8 (Mar/Apr), New Kites, Reports and tagged industry, KTAI, new designs.